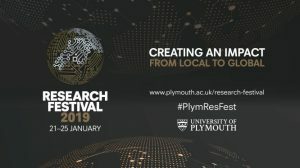 The Research Festival 2019 is a week-long programme packed full of innovation, progression, and exploration of our world and everything in it. The programme features fascinating events spanning the breadth of research undertaken at the University. You can find out about innovative projects, participate in intriguing discussions, open the door to new collaborations, and discover how your own research could be impacted. Along with all this, you can also hear about the latest successes and upcoming opportunities for Global Challenge and Industrial Strategy funding.